The receiver board features 48 hardware channels for simultaneous tracking of all visible satellites in GLONASS and GPS constellations.Â The AsteRx2 generates high-quality combined measurements for improved availability and accuracy in challenging environments. Offering flexible configuration, a powerful command language, a variety of detailed output messages, formats for automation and serial and USB2.0 interfaces, the AsteRx2 facilitates the work of the system integrator.Â In the future, the AsteRx2 will also become available in a rugged IP65 enclosure. 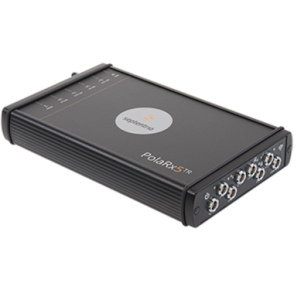 The PolaRx3 features a powerful fast acquisition unit and enhanced codeless tracking of L1 and L2 signals on 24 dual-frequency channels, yielding best-in-class, low noise data quality even under anti-spoofing. The PolaRx3 is integrated in a waterproof IP65 rugged enclosure with sturdy connectors, allowing usage in tough and remote environments. Communication with the units is easy with TCP/IP access over Ethernet. The PolaRx3 suits a variety of application needs, from decimetre level positioning to high-precision centimetre level RTK positioning.